Hello, forex friends! China has recently been one of the main drivers for market sentiment due to its leading role in the global equities rout for the past couple of weeks and the ever-deepening slump in oil prices. The spotlight may potentially be on China again this week since its GDP and industrial production readings are scheduled to come out this Tuesday (Jan 19, 2:00 am GMT). So, what do the available reports tell us? Is China set to grow at an even slower pace? Let’s find out! And while I’m at it, I might as well give y’all a brief monthly review on China’s economic situation. China’s Q3 2015 GDP grew by 1.8% quarter-on-quarter, which is the same pace as the previous quarter. However, it only expanded by 6.9% on an annualized basis, which is slower than the previous quarter’s 7.0% increase and slightly below the PBoC’s annualized target growth rate of 7.0%. Moreover, the 6.9% annualized growth is the weakest expansion ever since Q1 2009. We’re also interested on what drives China’s GDP growth, and the details of the report show that industrial production is the main driver, contributing around 34% to China’s GDP. Meanwhile, wholesale and retail trade, agriculture, and financial services account for around 8-10% each. As noted earlier, industrial production is the main contributor to China’s GDP, and China’s industrial output for the November period was just great since it grew by 6.2% year-on-year (+5.6% previous). Manufacturing output, which makes up the bulk of China’s industrial output, grew by a solid 7.2% year-on-year, which is an improvement over the previous month’s 6.7% increase. Looking forward, the official PMI readings from the National Bureau of Statistics of China (NBS) printed a slight increase from 49.6 to 49.7 in December, which is still bad since it’s below the 50.0 neutral level. However, a closer look at the report shows that the Production Index actually showed a marked increase from 51.9 back in November to 52.2 while the New Orders Index climbed from 49.8 to 50.2, so we may be seeing another healthy increase for December’s industrial output. Incidentally, the fact that the Production Index has always been above the 50.0 neutral mark helps to explain why industrial output keeps increasing even though the PMI numbers are in contraction mode. China’s retail sales reading has been steadily inching higher, with the retail sales reading for November up by 11.2% year-on-year (11.0% previous). This marks the fourth consecutive month of improving annualized retail sales growth. 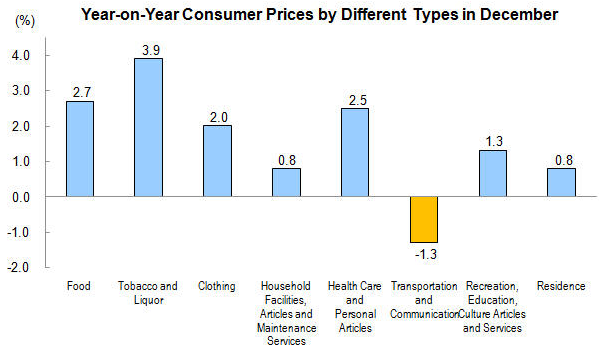 A quick scan of the report shows that many of the retail trade components had double-digit increases, but the “petroleum and related products” stood out like a sore thumb since it was the only component that was in the red. However, forex traders should note that this was probably because of the decline in oil prices rather than weakening demand for petroleum products. China’s December CPI increased by 0.5% month-on-month after stagnating during the previous month. This translates to a 1.6% year-on-year growth (+1.5% previous), with prices in urban areas going up by 1.7% while rural areas only saw a 1.5% increase. The uptick in the annualized reading was apparently due to the price of foodstuffs accelerating at a faster rate when compared with the previous month (2.7% vs. 2.3% previous), but most of the other components also saw a small uptick. Even the “transportation and communication” component was slightly less of a drag (-1.3% vs. -1.4% previous), with the “fuels and parts for vehicles” sub-component printing an 11.7% decrease, an improvement over the previous month’s 12.4% decrease. China’s economy has been going downhill recently, but available economic reports seem to imply that China did well during the Q4 months. A crucial piece of the GDP puzzle – industrial production for the December period – is still missing, but it would be released simultaneously with the Q4 2015 GDP report. Fortunately, the officially-sanctioned PMI readings hint at a potential upside surprise, but the PMI report from Caixin/Markit heavily contests such a happy scenario. And while the trade balance for the Q4 months has been hinting at stability on the surface, exports for the December period actually declined by 1.4% year-on-year on a USD-basis, which hints at some weakness in industrial production. However, rising retail sales readings seem to indicate that domestic consumer demand is offsetting the lower demand from abroad. At the end of the day, however, the Chinese government is gonna be the one to issue the GDP report and the industrial output readings. And industrial production is usually aligned more with the official PMI report from NBS. Still, 50 economists polled by Reuters expect China to “post its weakest economic growth since the global financial crisis in the fourth quarter.” With no clear direction on how China’s GDP will turn out, chances are good that forex traders may be seeing a lot of volatility in the coming days. 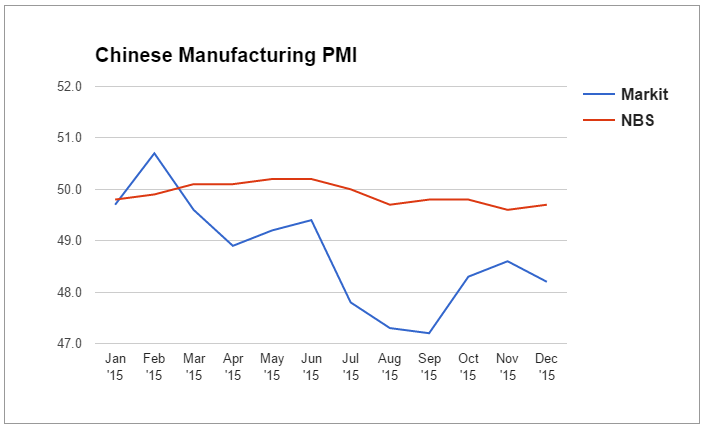 How do you think China’s Q4 2015 GDP will turn out? Share your opinions in the poll and/or comment below!